About a month ago, Hiroo Onoda died at the age of 91. He was a Japanese WW II holdout soldier who didn't surrender until long after the war was over. For 29 years, he lived on an island in the Philippines with other holdouts, dismissing all evidence (including messages sent to them) that the war was over. They lived by eating what they could find in the jungle or steal from local Filipino farmers. After losing all his fellow holdouts to various circumstances, Onoda was finally persuaded to give up in 1974. Also, we occasionally still hear press reports about Stone-Age tribes that hold out against the modern world ... in the Amazon ... Papua New Guinea ... or some remote island. In these days of iPads, space stations, and genetic engineering, some of these Stone-Age tribes don't even know how to make fire ... and have never heard of the wheel. Let's be clear about this. Under the SMA, Ecology is authorized to carry out the limited objectives of the SMA only, which is a planning law, not an environmental protection law per se. Under the GMA, Ecology is not authorized for anything, except to advise the Department of Commerce about Critical Areas. That bears repeating ... they are authorized to advise the Department of Commerce (not local Counties) about critical areas (not about the 14 goals or any other aspect of the GMA). Ecology would like you to believe that they are in charge of habitat and endangered species and wetland delineation and saving the planet and the whole GMA. They would like you to believe they are authorized to mainline their biased GMA advice directly into the veins of buffer-addicts in every County Planning Departments ... but they are not. Altogether different from the SMA and GMA, Ecology is separately authorized under the Clean Water Act (CWA) to regulate discharges to waters of the State/US, but their authority under the CWA is about discharges. They regulate pollution, not non-pollution. They regulate effluent, not waters. Nowhere, outside of the specific planning purposes of the SMA, is Ecology given authority to identify or delineate streams, wetlands, shorelines, or any other waters of the State/US. They have proclaimed themselves as the expert authorities in this area, but they are not. This brings us back to our Stone-Age lead-in. The Ecology folks who aren't authorized for much of anything produce Best Available Science (BAS) about everything. However, like the Stone-Age tribes who haven't heard of the wheel, the Cro-Magnons at the Shorelands and Environmental Assistance Program seem to be entirely ignorant of concepts accepted everywhere else in environmental science. As we repeatedly mention, they know nothing about risk assessment, but they also know nothing about environmental chemistry ... or geology ... or habitat ... or hydrology ... or physics ... or bio-statistics ... system dynamics ... or science generally. They say revealingly stupid things like (from the Hruby report), "The recent research has also increased our understanding of the many different factors that control the effectiveness of a buffer at trapping pollutants" such as type of pollutant, concentration of pollutant etc. Increased "our" understanding? How could you not know this? This is in every elementary textbook (and there are thousands) dealing with risk assessment, fate and transport, and environmental chemistry. These principles are at work daily in Ecology's own Toxics Program. This is like a Stone-Age tribesman in the 21st century saying that "we" just discovered fire, and then bombastically posturing as if they are on the cutting edge of discovery. Somehow, and I don't know how, the Shorelands and Environmental Assistance Program has been able to survive like a lost Stone-Age tribe, surrounded by modern technology, but unaware of it. Along with them are fellow holdouts comprised of planners, consultants, attorneys, and non-profits who profit from believing the earth is flat. We have to contend with their ignorance and bias in maddening ways, one of which was mentioned by some commenters to the previous post ... namely scientific uncertainty and the application of the precautionary principle. One of the ways Ecology projects their power and Stone-Age ignorance is by practicing data sophistry. For instance, we actually have quite a bit of data in these islands that show that we have no problem. Cleverly, though, that gets twisted by Ecology and the County into an opportunity to apply the precautionary principle. Let's discuss an example for the sake of illustration. If I were to sample a stream for pollutants, and if the results were to come back as non-detects, that is positive evidence of no problem. We have lots of data like that here in the islands ... after taking into account data quality, we have positive evidence of no problem. The evidence for "no problem" is in the form of zeros (non-detects) but that's not "no data" and it isn't "uncertainty." It's just that we found nothing because nothing is there. Finding positive evidence of nothing, however, gets transmogrified into "we have no data" or "we don't know" or "it's pristine" or "the results are inconclusive" or "we're uncertain" ... and before you know it, the precautionary principle gets invoked, and we get 300-foot buffers in rural areas and 50-foot buffers in urban ones. That's how that happens. The absence of a problem and lots of "zero data" gets manufactured into uncertainty requiring the greatest amount of precaution and the toughest land use restrictions. The cleanest areas get "protected" in the most severe way when any rational analysis would have deployed greater "protection" for the riskier exposure scenario. We have to put a stop to that BAS ackwards outcome by pointing out what the data are really saying. We have written about the Department of Ecology's Tom Hruby before. Whenever Erik Stockdale of Ecology requires heavy-duty science backup, he calls in Dr. Hruby, and the results are usually farcical. Some of their collaborations are masterpieces of ignorance, like when they wrote a letter to our Council in February 2011 about "risk." Eventually, they had to back away entirely from that letter because of copious criticism, including from Dr. Tim Verslcyke, a highly-qualified and well-published ecological risk assessment professional on the faculty of Woods Hole Oceanographic Institute. 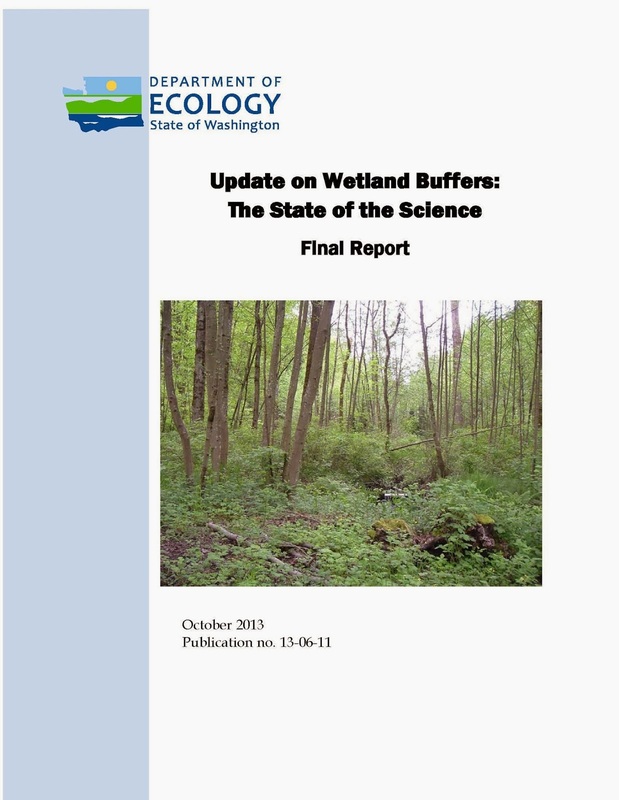 So it was with some trepidation and amusement that I began to read Hruby's latest publication, Update on Wetland Buffers: The State of the Science, Final Report. Relative to genuinely professional work about risk assessment and/or fate and transport, it's still amateurish ... but nevertheless ... it isn't completely wrong. Let's review a couple of the good things about this mediocre report. For water quality, Huby admits that the effectiveness of buffers depends on site-specific factors. He says that recent research has increased our understanding of the many different factors that control the effectiveness of a buffer at trapping pollutants, and then he names width, slope, type of vegetation, type of pollutant, geochemical and physical properties of the soil, infiltration rates of the soils, sources of pollutants, concentration of pollutants, path of surface water through the buffer, and for phosphorus, the amount of phosphorous already trapped by the soil. For habitat, Hruby admits that studies do not show minimum buffer distances needed to protect species, but only show how far species roam from wetlands. He also says that there is very little research correlating plant diversity in wetlands with buffer width. Please note that this document specifically mentions, for the first time, some very key points that side with the persistent criticisms of our CAOs. Our CAOs have never considered type of pollutant, concentration of pollutant, source of pollutant, or the geochemical and physical properties of the soil. This is what we mean when we talk about an "exposure scenario." Dr. Hruby is ignorant of standard risk assessment terminology, so he doesn't use the customary term, but that's what he is referring to. Furthermore, we have all heard the Department of Ecology and Dr. Adamus proclaim that amphibians can be found hundreds of feet away from a wetland; therefore, buffers should be hundreds of feet wide to accommodate their roaming. Hruby admits that this "roaming data" is not related to buffer width. Stated another way, there is no science that explains how the distribution of wetland dependent species varies with buffer width. Amphibians may roam hundreds of feet away from a wetland regardless whether the buffer is hundreds of feet, tens of feet, or nonexistent. We do not know how, or even whether, changing buffer width affects species distribution. Anyone who has found tree frogs in their window boxes, for example, knows that tree frog wandering does not seem to depend on buffer size. There are other good admissions in this report. Key Point #4 on page 30 says "Several researchers have recommended a more flexible approach that allows buffer widths to be varied depending on site-specific conditions." On page 10, the report says, "Site-specific factors (vegetation density and spacing, initial soil water content, saturated hydraulic conductivity, and sediment characteristics) are so important in determining the effectiveness of a buffer that simple designs that do not account for these factors can fail to perform their protective functions." And lastly, this report discusses the Meyer and Zhang papers, both of which have been the topic of intense discussion at various Planning Commission and County Council meetings over the past two years. We'll save our substantial criticisms of the report for the next post, but for now, take some heart in the fact that even a blind Department of Ecology can find a nut once in a while. The Growth Management Hearings Board (GMHB) ruled on our proposed CAOs on September 6, 2013. In October, the Department of Ecology came out with a new Best Available Science (BAS) document titled, Update on Wetland Buffers: The State of the Science, Final Report. It was authored by none other than Tom Hruby, the go-to wetlands science guru at the Department of Ecology. This 2013 document updates Ecology's 2005 guidance on wetland buffers in some substantial ways. Over the next few postings, we will delve into the new document, but for now, suffice to say that while the new document still has some significant problems, it makes some surprising admissions too. In answer to the question of how large buffers should be, the new 47-page document essentially says, "It depends." Yes ... it depends on a myriad of site-specific factors ... so it is impossible to prescribe fixed buffer widths ahead of time. Wow! 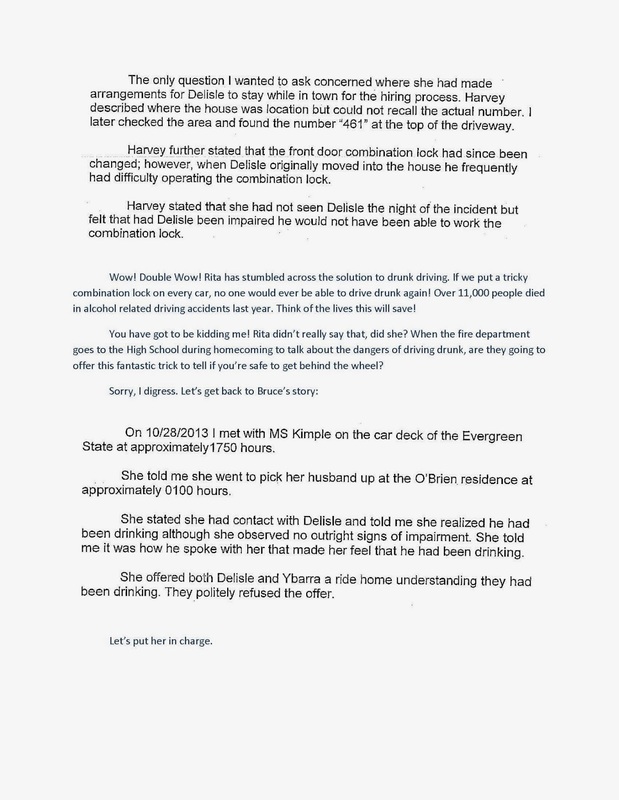 County staff have known about this report since it was issued. This fact came to light during CAO public comment last week. CD&P knew about it. County Manager Mike Thomas knew about it. Nevertheless, all during the effort to "fix" the latest version of the CAOs after the GMHB ruling, those who have been "in the know" did not inform the Planning Commission about the new document. Those "in the know" did not inform the Council about it either. Interestingly, even Ecology's official correspondence with the County doesn't mention their own new science document. Among other things, the 2013 Final Report talks about the Meyer paper, and it talks about the Zhang paper. When deliberating about potential revisions to the CAOs back in November, Planning Commissioner Brian Erhmantraut tried to get the Planning Commission to consider buffers based on the Zhang paper, but the other Commissioners shot down the idea because (they thought) the Zhang paper wasn't supported by Ecology BAS. So, the Planning Commission and CD&P pressed forward in making revisions to the CAO based on 2005 BAS, not 2013 BAS. That's where we are at the moment. We have CAO revisions based on outdated BAS. The 2013 BAS document is very inconvenient to anyone who just wants to get 'er done because it raises serious questions about the basic validity of Ecology's historical approach to buffers ... and our County's approach as well. The new BAS document is not perfect by any means, but at least it is nudging closer to the truth. Considering it was issued by the Kremlin of buffer science, it makes some astonishing admissions. But "they" buried it so no one would be the wiser. New BAS report issued after the San Juan County GMHB ruling and at about the same time as the SCOTUS Koontz decision. There is a parable about a man walking down a road and repeatedly falling in a hole. He tries to avoid the hole, but his efforts are fruitless. He tries to patch the hole ... he tries to put up barricades to avoid the hole ... he tries to put planks over the hole so he can safely cross ... nothing works ... he falls in every time. In his frustration, he pleads to a friend, "What can I do to stop falling in the hole?!?" His friend tells him, "Take another road without a hole." 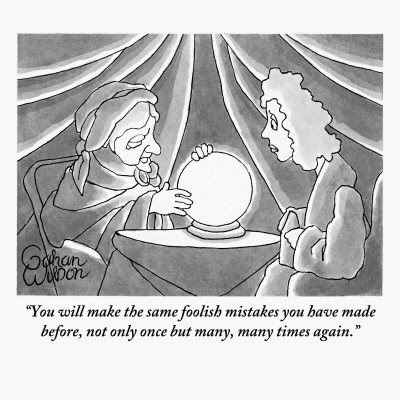 This could be a parable about the CAOs. The County continues to fall in the same hole every time. The latest 78-page draft of the CAOs is no different from any previous approach. Like all previous Councils, this Council just doesn't get it. They don't understand "protection." They don't understand "risk." They are trying to follow what they believe are State mandates. They timidly react to every letter from the Department of Ecology as if they were in the presence of the burning bush. Protection is inextricably linked to an exposure scenario. Football helmets provide protection during a football game, but they offer no protection if you wear them at a cocktail party. The risk of getting bonked on the head at a cocktail party is de minimis anyway, so the extra cost of wearing a football helmet is wasted. For the same reason, you would be foolish to undergo chemo therapy just because you might be afraid of cancer ... or just because you might have been exposed to de minimis levels of carcinogens. The cost and side effects are high whereas the benefits are non-existent. We have a 78-page CAO that explains in great detail how to wear a football helmet at a cocktail party. It tells us what color the helmet should be ... how thick it should be ... what the internal padding should be ... how the chinstrap should be worn ... and on and on. It references Best Available Science (BAS) by experts who proclaim that football helmets prevent concussions. The Friends and their allies at the State say that, without the biggest football helmets in the universe, our risk of dying from a concussion is extremely high. No. The absence of a "protective" measure (i.e., a helmet) does not create risk. Risk arises from our behavior and ambient factors (i.e., cocktail party versus football game). The absence of a remedy may fail to mitigate risk, but the absence of a remedy does not "create" risk. Regarding the CAOs, we occasionally hear public officials say, "Tell us what needs to be fixed and we will fix it." To those officials, listen carefully ... it is unfixable because you have chosen the wrong path. If you do not first evaluate exposure scenarios, it is pointless to prescribe a remedy. The County is imposing protective measures without providing county-specific evidence of an exposure scenario justifying those measures. The State and County habitually (and erroneously) say we are in a high-risk situation only because of the absence of their favorite purported "protections," not because there is any evidence that our behavior is creating an exposure scenario with excess risk. The "protections" being foisted upon us, land use restrictions, would not be protective anyway. If we did find ourselves in a high-risk exposure scenario, land use restrictions would be the least effective way of mitigating the risk. Other, less-costly remedies would likely be vastly more effective. If there is a fix, our CAOs should simply say, "We will develop and implement site-specific remedies to mitigate excess risk related to critical areas, commensurate with our ability to measure such risk and directly link site-specific development activities as the cause." Unless our public officials can get some simple concepts through their thick heads, we will always find ourselves in the same hole. Tomorrow morning (February 11, 2014) at 9:15, the County Council will take public comment on the latest draft of the CAOs. This Council has decided to go forward by going backwards ... in all senses of that word. This Council has decided to proceed with yet another new CAO despite still-pending litigation on the last version. This Council's CAO work has been so unoriginal that they haven't even mustered the creativity to make their own mistakes. They are recycling a CAO framework first thought up, and then rejected, by Shireene Hale and the previous Council years ago. It's not simpler. It's not better. It's not newer. The new old version is currently planned for enactment by the end of March. There is a culture of government corruption in these islands, and its meme carries with it a narrative that says, "Give us money or else we'll all die." We've seen this meme at work when it comes to phony environmental "protection." It also seems to be at play with some of our police, safety, and fire departments on occasion. They're willing to save us, as long as they get lots of cash up front. While attention has been focused on the San Juan Christmas hayride, some strange incidents also are being talked about on Orcas, where the nephew of Randy Gaylord, Kevin O'Brien, is Chief of the Orcas Fire Department. Orcasites approved a controversial levy several years ago that was advertised as necessary for capital infrastructure (another new firehouse and new fire-fighting equipment), only to have Chief O'Brien recently reallocate those funds to payroll, including creating new paid positions, including a new, highly-paid deputy. 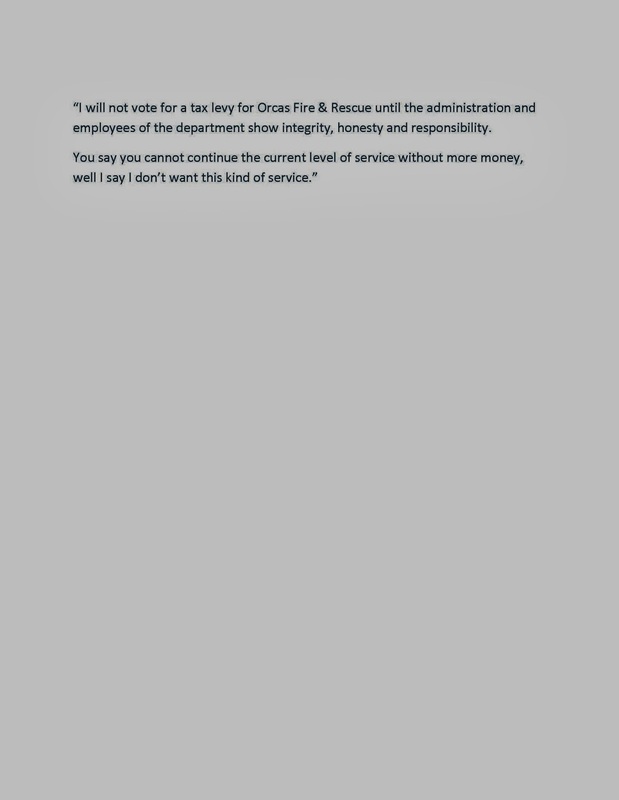 Now the "temporary" levy is up for renewal, and the Chief is claiming that if it is not renewed, services will have to be cut. 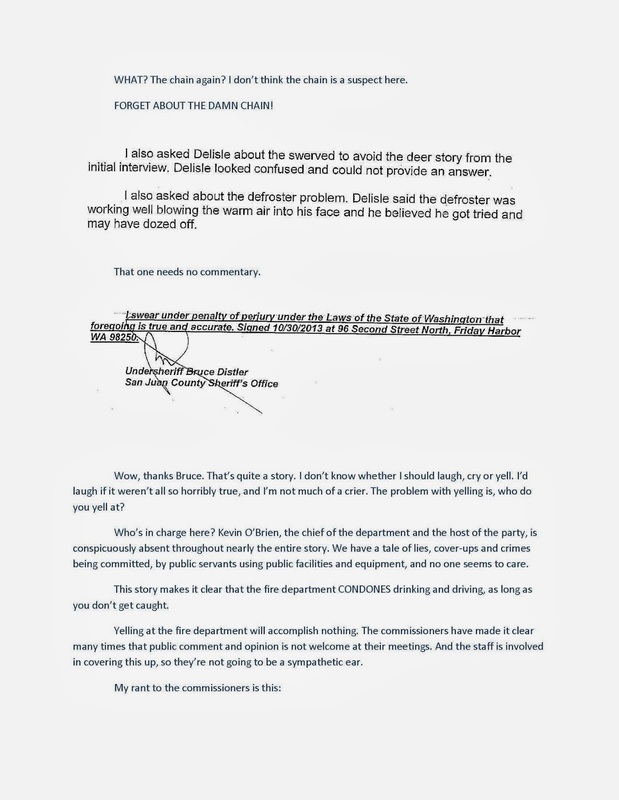 These events have occurred against a backdrop of many rumors of bad behavior by the Orcas Fire Department ... everything from having dinner flown in from Bellingham ... to staff using the Fire Department washing machines as their personal publicly funded laundromat. 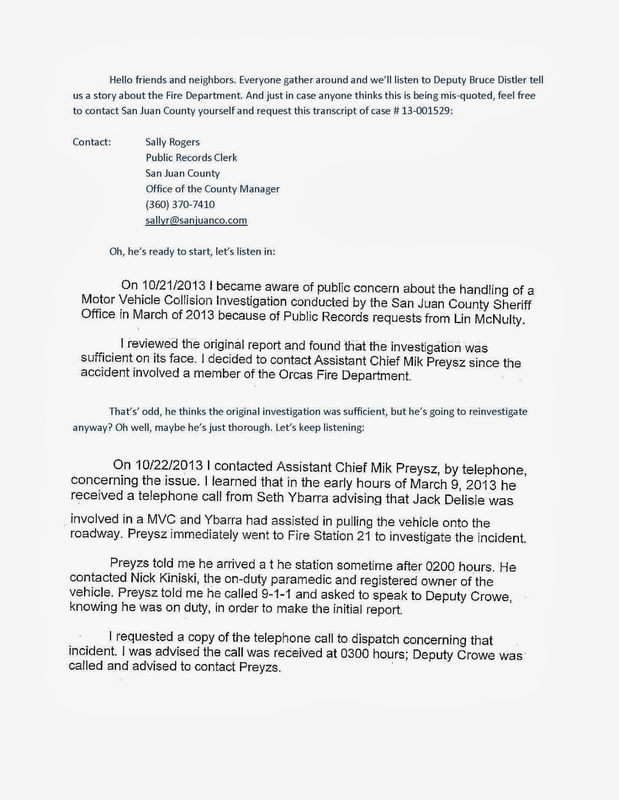 New questions have arisen about the Orcas Fire Department sparked by an accident involving Jack Delisle, one of those hired by O'Brien. 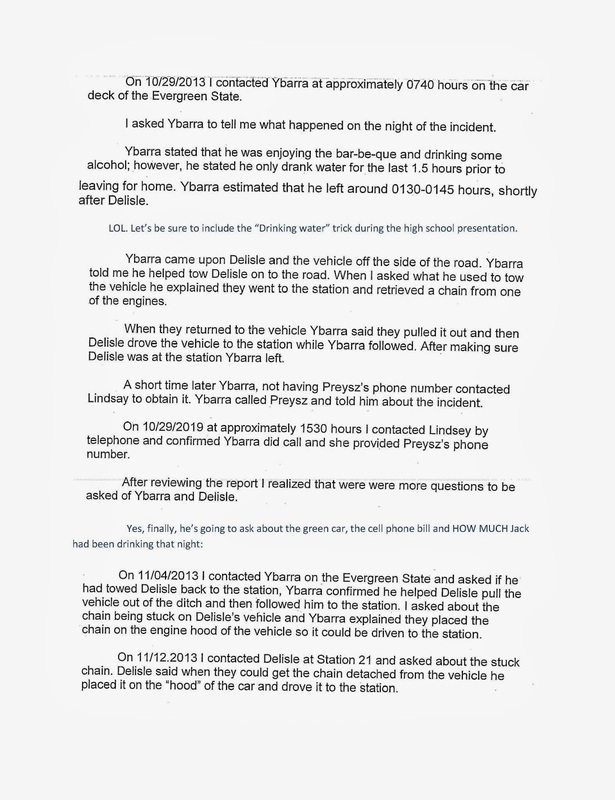 In short, Delisle got into a single-car accident at about 2am back in March 9, 2013. He ran a car off the road and into a ditch. The car was owned by another member of the Fire Department, Nick Kiniski. 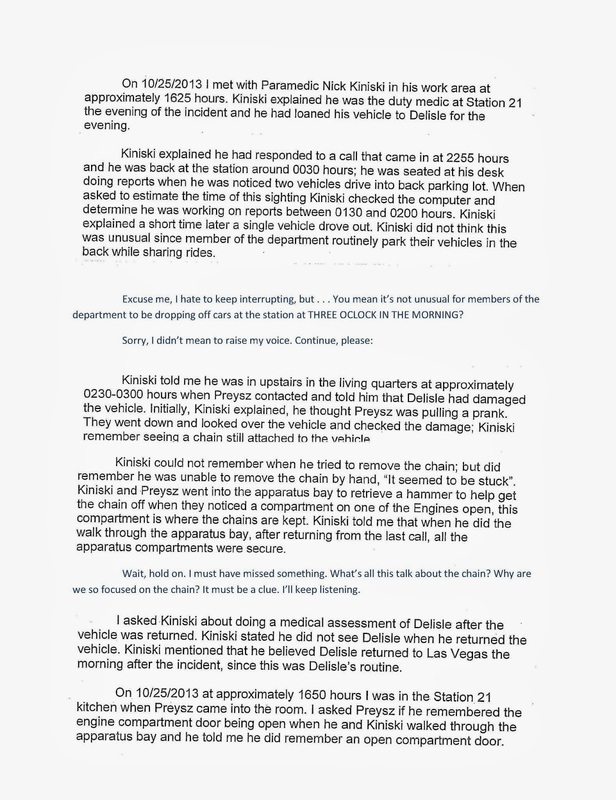 Yet another member of the Fire Department, Seth Ybarra, came to Delisle's aid after the crash, pulled the car out of the ditch, and towed it to Fire Station 21, where Kininski was on duty that night as a paramedic. As some Orcasites tell it, the gist of the concern is this: a member of the Orcas Fire Department (Ybarra) allegedly removed evidence of a crash involving a drunken driver member of the Fire Department, did not properly notify the police, and let the injured driver disappear from the scene. 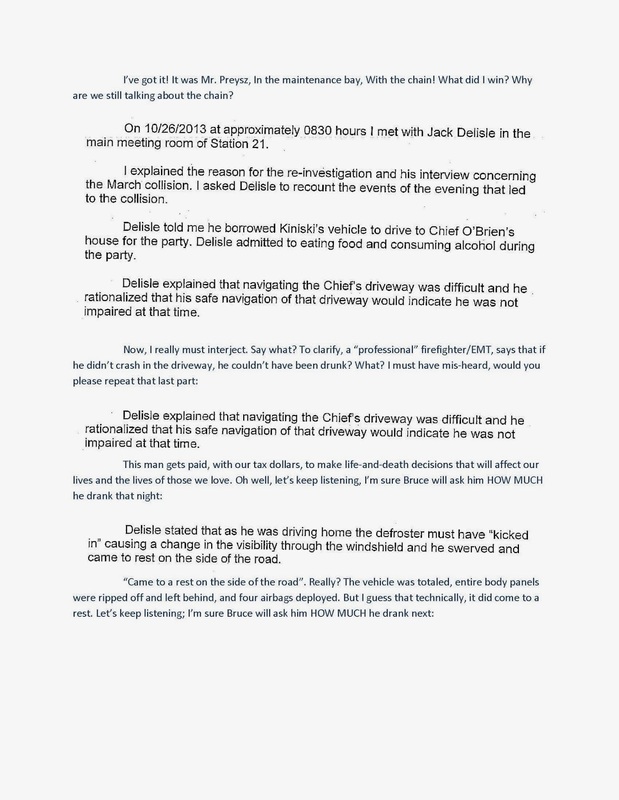 Earlier that night, the driver had been attending a party at the Chief's house to celebrate his (Delisle's) hiring. 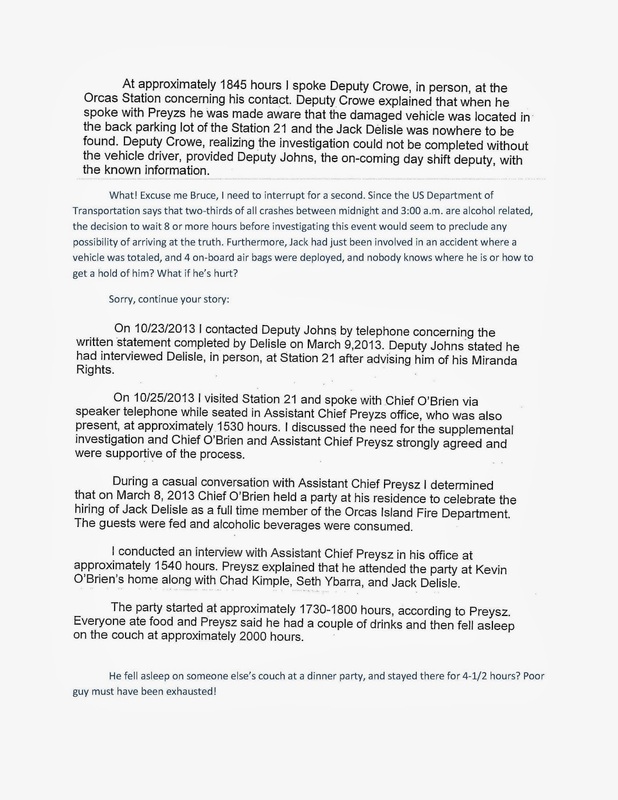 The Chief had served food and alcohol at the party. 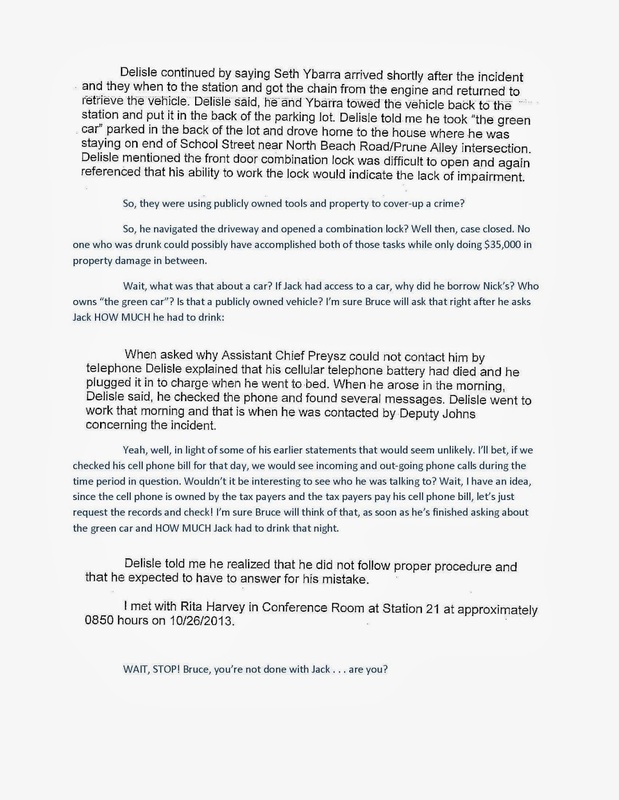 A detailed report of what happened is provided in the scanned pages shown below, and it includes some commentary and questions inserted by a concerned citizen on Orcas. 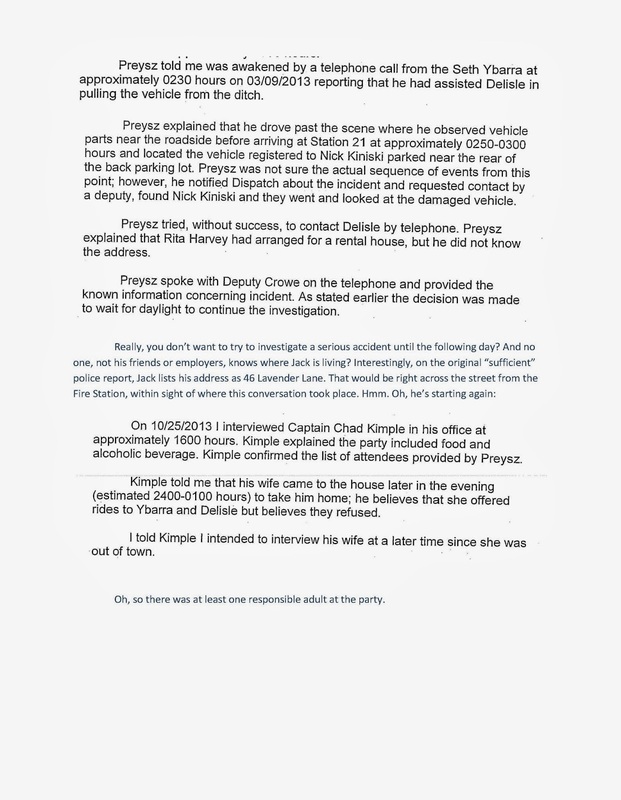 This story has not been reported anywhere, so perhaps Orcasites can shed some further light on these events. With the "temporary" levy up for renewal, issues of Departmental integrity and responsibility are on the minds of many on Orcas. In other news, the latest draft of the CAOs is undergoing public comment this week. As bad as the last Council was regarding the CAOs, the new Council has been worse. Their public participation record is awful. Their ability to think through the issues is abysmal, and their "fixes" to the CAOs have done nothing to correct its fundamental flaws. In its latest CAO version, the Council has decided to abandon the last Council's system for buffers and replace it with another one that is equally flawed. For more information, please visit the CSA website. This Council is just as much in the pocket of the Friends as the last one. In addition, Councilman Jamie Stephens was seen in Olympia this past week. He attended hearings put on by the House Agriculture and Natural Resource Committee regarding Ecology's practice of sending out threatening letters. Stephens didn't testify, but he sat in the last row near the door next to the Sierra Club representatives ... being very Friendly.